Lushome presents a wonderful redesign project that turned an old garage into a comfortable, spacious and modern home office. 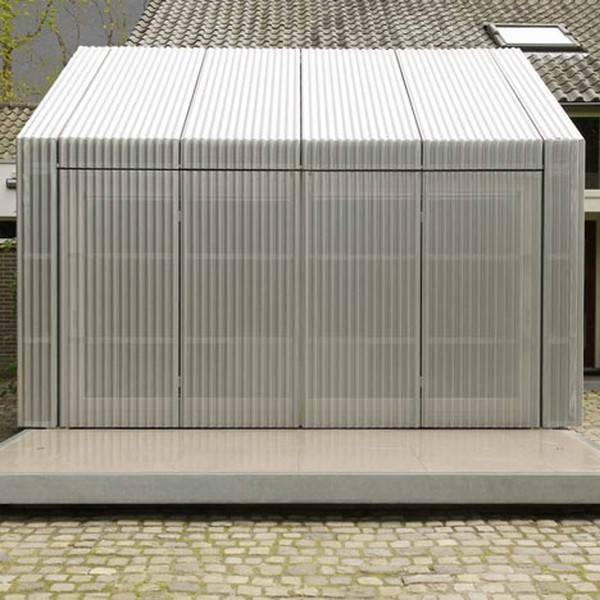 Dutch studio Architecten redesigned the car garage into a contemporary small home office with a large sliding glass doors and folding doors that keep the office warm in winter. The house is located in Eindhoven, the Netherlands. 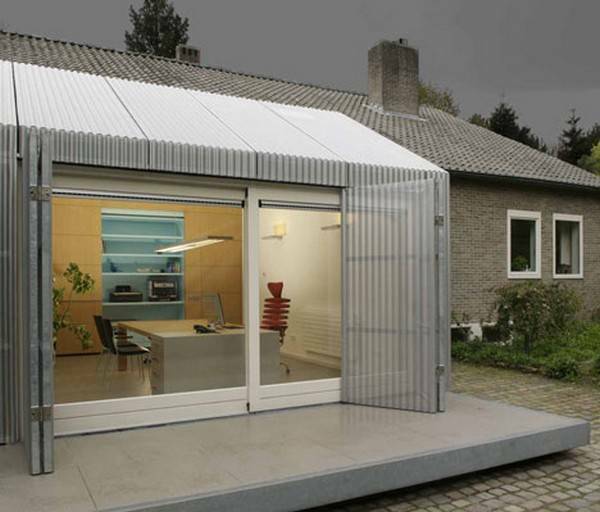 The garage is wrapped into corrugated aluminum and attractively decorated inside, providing a very pleasant, light and airy small home office for the house owners. 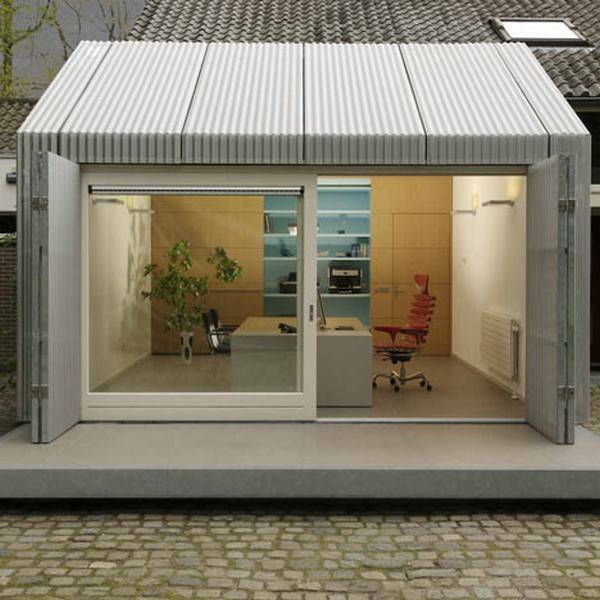 The elegant mini-office design mask the old structure, and perforated aluminum, used as a material for walls and roof design, add a contemporary vibe to small home office exterior. Pitched tiled roof of the main building and a new small office look harmonious together, sharing similar gray colors and enhancing the comfortable and modern feel. 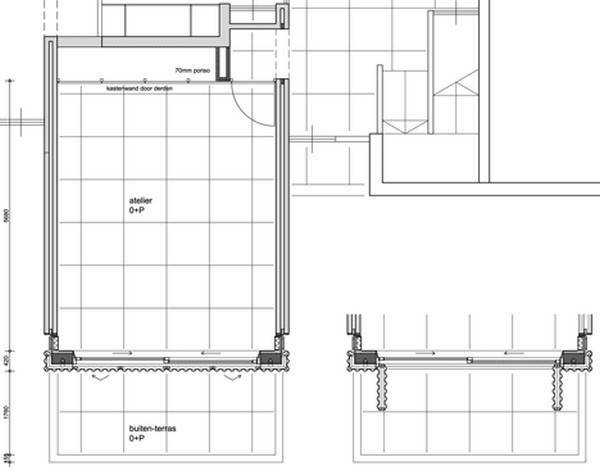 Tiled floor features large square shaped tiles that helps extend small home office design to the open terrace. 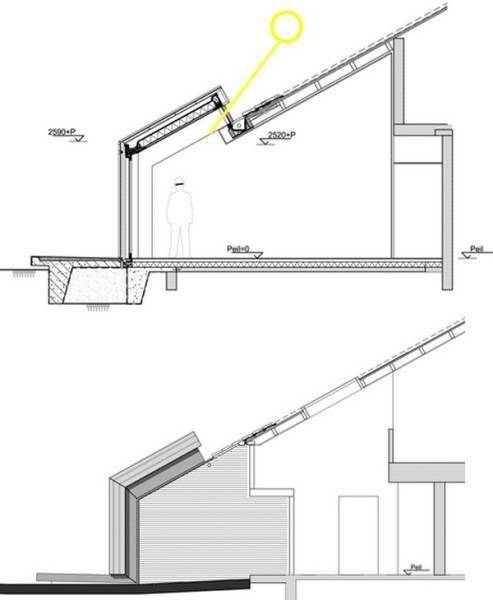 Galvanized steel emphasizes the border between old and new elements, and provide a frame for opening glass doors. 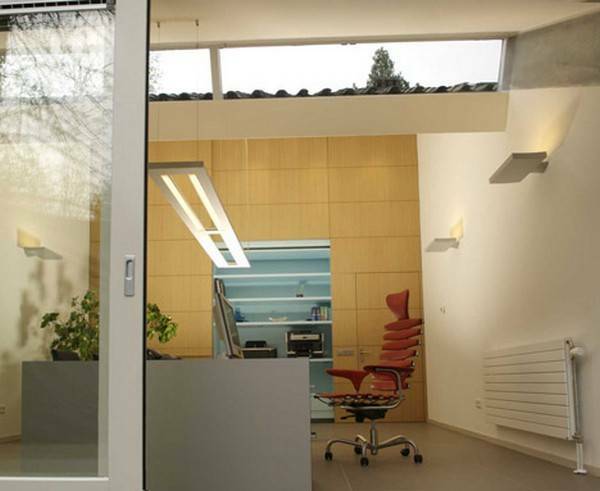 The sliding glass doors also increases the area of ​​the office with glass doors while adding character to a small home office that does not even look like a former garage, redesigned by Architecten, www.architecten-en-en.nl/. Office interior design is created with neutral colors and warm wooden wall panels. A door to the house is incorporated into shelving with wooden doors. A solid office desk in minimalist style conveniently has drawers. Two rood parts are connected with an additional large window. The combination of light interior design ideas and materials with neutral color tones and warm colors of wood create this harmonious and pleasant office interior and exterior design. The large sliding glass doors connect the small office design with the surroundings and provide a nice view of the garden and stone road. The abundance of natural light that flows through the sliding glass doors and closing aluminum shutters make this home office design very bright and functional. The folding doors create modern shutters that provide privacy, help adjust the amount of sunlight in the office and make this small home office interior more comfortable and pleasant. The garage redesign idea is original, creative and interesting. This garage makeover project can be used as a great inspiration for small home office designs.